Alumna Rima Hourani funds faculty research relevant to contemporary health care needs in Lebanon. Doumit’s research will look into the practices and attitudes of Lebanese women toward breast cancer. In yet another extension of support toward LAU, alumna Rima Hourani has turned her attention to the Alice Ramez Chagoury School of Nursing (ARCSON) where she has established the Rima Hourani Annual Nursing Research Grant. The gift will provide around USD12,500 to faculty members conducting research relevant to contemporary health care needs in Lebanon. “Rima Hourani has been one of our best supporters from day one, providing scholarships in the past and this year extending her support to create the grant for researchers,” asserts Dr. Nancy Hoffart, founding dean of ARCSON. Hourani, a ’70 graduate of the Beirut College for Women (which later evolved into LAU) and her husband Amal have been continuous benefactors to LAU since 1993. The scope of their positive impact, felt across various departments, has earned Rima Hourani the Alumni Recognition Award in 2011. Of Palestinian origin, one of her most recent initiatives was to provide USD200,000 to Palestinian students at the Schools of Nursing and Pharmacy. “The Houranis have also named facilities at the School of Business and on the Byblos campus in addition to Rima Hourani’s major role in the annual LAU fundraising gala dinner,” says Nassib Nasr, assistant vice president for development. “I believe strongly in education and that is why we are committed to LAU,” declares Rima Hourani. Her decision to single out the School of Nursing this year was inspired by her recognition of the ever-demanding healthcare sector. “These are professions that heal people,” she emphasizes. 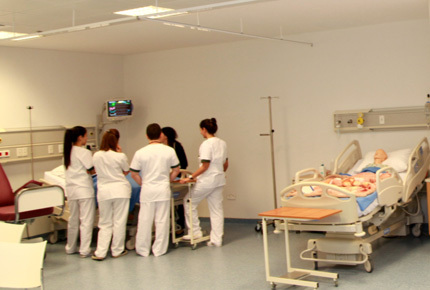 In only its fourth year of operation, the School of Nursing envisions developing and testing approaches to nursing care that are tailored to the needs of the Lebanese population. Under the leadership of Hoffart, faculty members are encouraged to undertake research in a context where dedicated funds remain limited in Lebanon. “Research is a component that we are trying to push at LAU and so we eagerly welcome the annual research grant as an important milestone in the journey of our young school,” emphasizes the dean. A team from the development committee reviewed funding proposals from faculty members and selected Assistant Dean Myrna Doumit as the grant recipient. Joining the university with 21 years of experience in academic nursing, Dr. Doumit is a qualitative researcher focusing on the quality of healthcare for cancer patients in Lebanon. “I was extremely happy to know that we received money earmarked for research. This denotes the trust that the donor has in the nursing profession at LAU,” she said thanking Hourani. Doumit’s research will look into the practices and attitudes of Lebanese women toward breast cancer. The results of the study will be used to develop interventions to improve their responsiveness by planning a culturally appropriate strategic approach to enhance women’s compliance with screening measures. With Breast Cancer Month coming up in October, such research is a timely initiative in line with the global campaign to increase local awareness about a disease affecting millions of women every year.